NASHVILLE, Tenn. (WTVF) — It was the night the Metro Schools director, Dr. Shawn Joseph, had hoped to end questions about how millions of dollars of your money was spent. 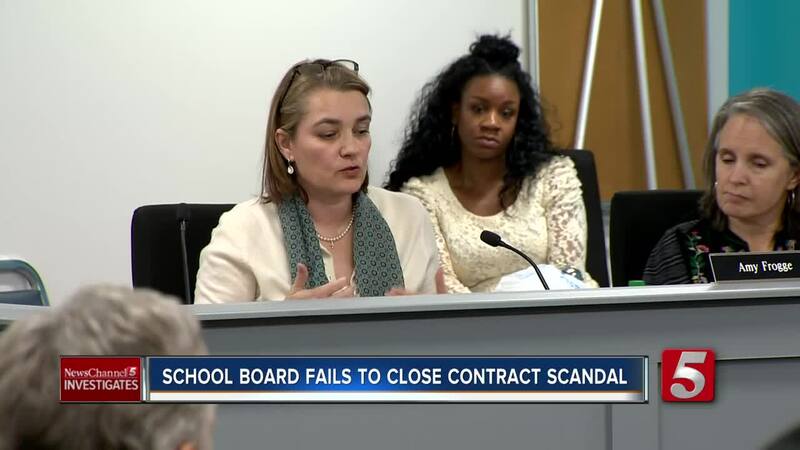 Instead, a beleaguered Metro School Board prepared itself Tuesday night for more questions and more investigations -- amid a contract scandal uncovered by NewsChannel 5 Investigates. As the meeting began with remarks from citizens, members of the public were divided. "Let Shawn Joseph lead the district as you hired him to do," one woman demanded. "We now find the director waddling in no bid handouts to cronies," one man suggested. Joseph suggested the real issue was something else, comparing the murder of 17-year-old Trayvon Martin and the treatment of other African-American men to the questions he's now facing. "What we know is fear is a mind killer," the school director said, as pictures of Martin and other projected onto monitors around the board room. Joseph said a recently released Metro audit ought to be enough to put the questions to rest. "We now should respect their professional work and accept the responses they have provided," he added. But school board member Amy Frogge pointed to questions recently uncovered by NewsChannel 5 Investigates about companies that got no-bid contracts under Joseph's administration and about his team misled the board about key details. "These are new allegations," Frogge said. "This is not just continuing to dig up the same problems. These are pretty shocking allegations, apparently to the rest of the city. I don't understand why the board is not reacting at all." School board chair Sharon Gentry was frustrated. "We keep finding things and digging things," she said. "When the investigative journalist becomes the voice of authority at the board table, that's just bizarre to me. Maybe it's just me. It's absolutely bizarre to me." Frogge argued that she had been raising these same issues for almost a year. "I am kind of astounded that this board would sit here and turn a blind eye to multiple allegations of breaking the law, breaking our board policy and the director being fully untruthful to the board," she added. "All this is documented on NewsChannel 5. If you don't believe me, go and look." School board member Christiane Buggs said she's hearing from city leaders who will be voting on the district's upcoming budget. "Some of the news stories, they are using these as reasons not to fund us," Buggs added. "I'm at a point where I kind of just don't know what to say. I was really excited for this audit to come out, for this report, because I was hoping that one way or the other we would be done with some of these conversations and be ready to move forward as a district." Earlier in the day, the committee that oversees Metro's internal auditor declined to accept the Metro Schools report, saying they have questions about whether auditors overlooked key details. Meanwhile, the school board got a much awaited report from a law firm they hired to investigate the district's sexual harassment investigations. Right now, they're keeping the report secret. Still, they ended up approving a $350,000 settlement with three of those victims.